What is the Metabolic Comeback? Is your metabolism functioning at it’s optimum potential? Are you lookimg to improve digestion, lower blood sugar levels, lose bloat, and feel your best? The Exercise Coach has designed a simple wellness and weight loss solution called The Metabolic Comeback™. The Metabolic Comeback is a uniquely designed process that will absolutely maximize exercise and nutrition success for anyone, regardless of current fitness level. Additionally, its effect on individual metabolism is very positive, and anyone over 40 years old will probably really welcome some metabolic assistance. For the record, metabolism refers to the sum of all hormonal processes and chemical reactions that take place in a person’s body every day. We’ve learned the influence that exercise and eating has on metabolism greatly impacts two areas – wellness and weight control. In reality, you are always on either a positive or negative “metabolic trajectory.” For many of us, our weight gain or loss will be a pretty good indicator of the path we are currently on. 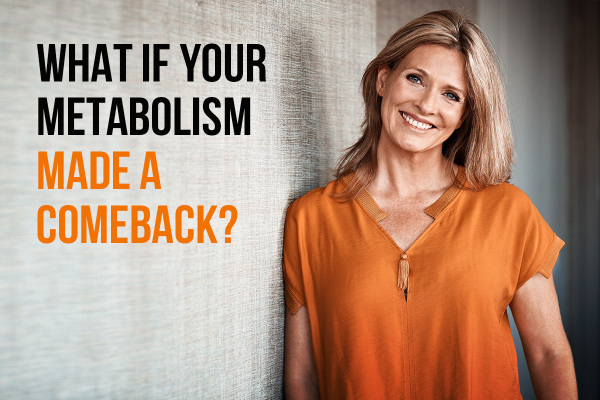 The Metabolic Comeback™ is designed to turn around weeks, or even years, of “negative trajectory” and put you on the path to sustained optimal wellness and a healthy weight. The Metabolic Comeback is the product of years of research and experience, work with thousands of clients, and the combination of some cutting-edge products that you can find at The Exercise Coach® studios around the country. Here is the basic formula for The Metabolic Comeback Experience: Whole-Effort Exercise + Whole-Food Nutrition = A Whole New You. Wouldn’t it be great to make this year your healthiest year ever? It sure would, and that’s exactly what can happen with a commitment to The Metabolic Comeback! Let me share a bit about what makes our powerful formula so effective for people who need to see better results and don’t have the time or inclination to become a fitness fanatic. Science-Based – Workouts at The Exercise Coach® are based on the science that links metabolic trajectory and health with muscle fiber physiology. Our approach uses specifically designed protocols that promise to deliver the most thorough muscle activation possible, and therefore the greatest total-body results. Data-Driven – Each workout involves precision personalization and real-time bio-feedback to keep our client’s efforts exactly on the right track. It’s truly the smartest burn around! Fat-Burning – Our training sessions focus on improving muscle quality, in order to burn fat and build strength. The days of long workouts are over if you really want to maximize your results. Strength and interval training designed to ignite your metabolism for “always on” fat-burning, is the way we do it. 20-Minutes – This is the part you have to see (actually feel) to believe. It’s true, though. We have helped thousands of people get the results that matter most to them through our hyper-efficient 20-minute workout approach. It’s one of the things our clients love most about us. That’s right, every workout will be 20-minutes long and we can get you from where you are to where you want to be. Coach-Led – Our friendly, knowledgeable coaches are trained very specifically to deliver better results in less time. They are committed to making each of our clients feel comfortable and at home, as well as removing all the guesswork for them. They assess their needs, customize workouts using smart training technology, and then educate and motivate them to reach their goals. A Proven Playbook – Our Co-Founder, Gerianne Cygan, has assembled a user-friendly guide that organizes all the principles our coaches refer to in one convenient playbook. The Exercise Coach® Nutrition Playbook makes sense of which foods can help and which foods can hurt your metabolic health. A Powerful Kickoff – The Metabolic Comeback™ Challenge is a 30-day commitment to combining whole-effort exercise with whole-food nutrition. This focused personal initiative is designed to quickly turnaround a sluggish metabolism, optimize hormonal health, and encourage participants with real results in just 30-days. A Practical Journey – The Exercise Coach® Nutrition Playbook is not just about fast results, but it’s also about sustainable practices for life-long health and wellness. The material is designed to teach you how to eat well as a lifestyle so you not only maintain your results, but from time to time are able to reach new levels of achievement. The Metabolic Comeback™ is something you can experience at any Exercise Coach® studio around the country. Fill out the form below to find the studio nearest you to get started on your very own Metabolic Comeback!